April 7, 2007. 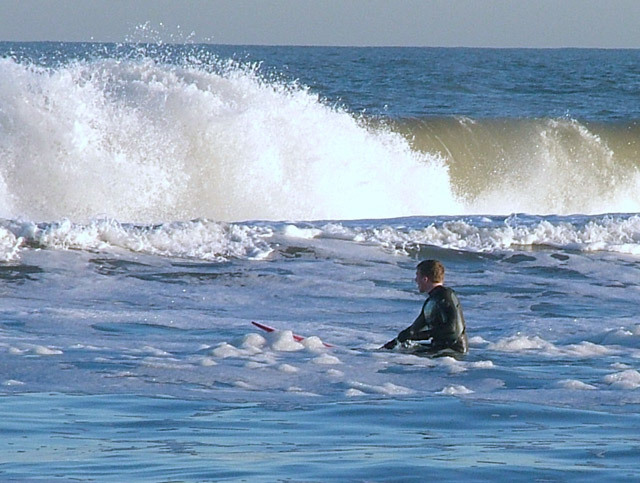 Austin tries out Lee Avenue cold-water surfing. Hypothermia is a serious concern, but he thinks he is well equipped. April 7, 2007. Having satisfied proof-of-concept (i.e. 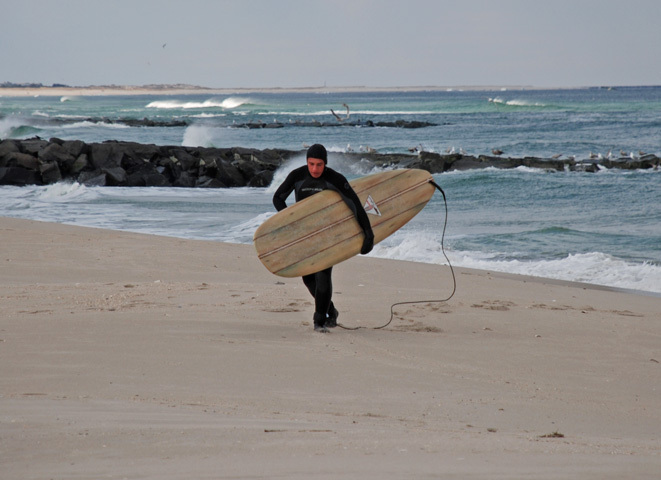 one ride), Austin & his longboard make a hasty retreat. April 7, 2007. Both air and water temperatures are in the thirties, not exactly beach weather. We head to the house...QUICKLY. March 29, 2007. 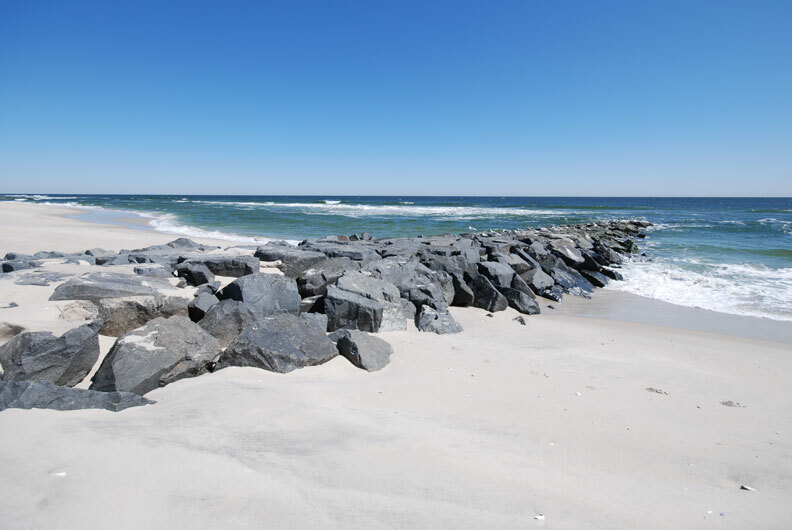 Our Lee Avenue jetty has survived the winter. 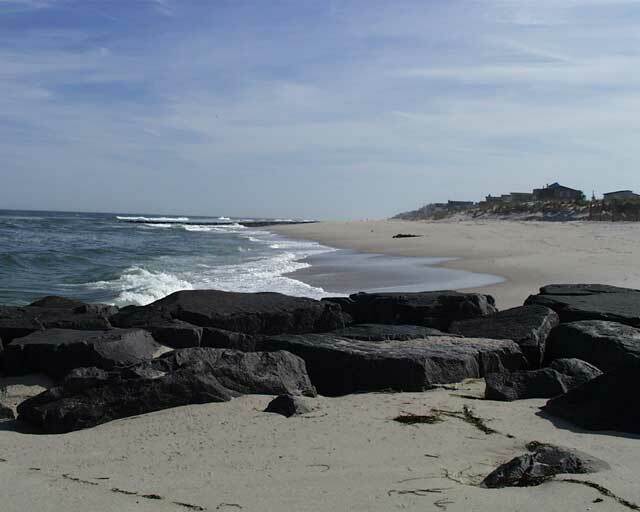 Actually, the jetty always survives. 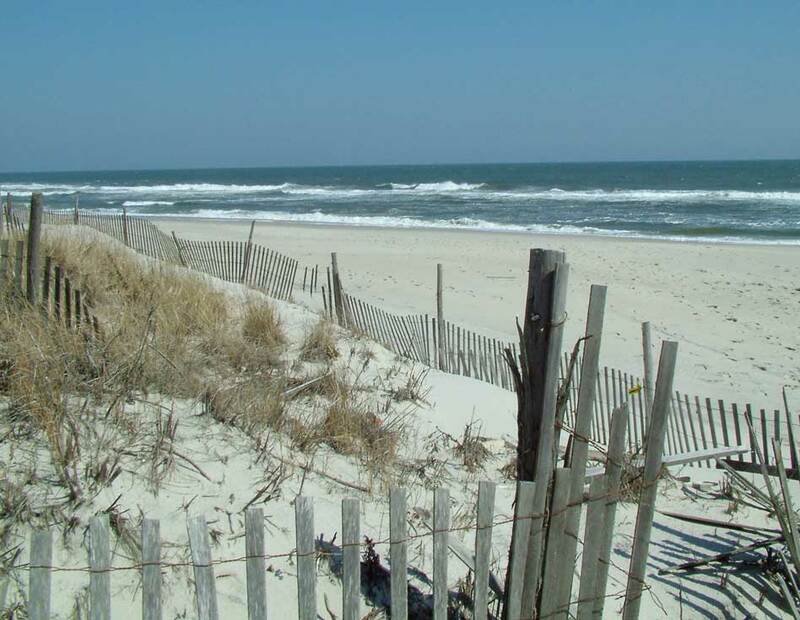 The beach is our real concern. March 29, 2007. Hello, beach! We're ready for the 2007 season. 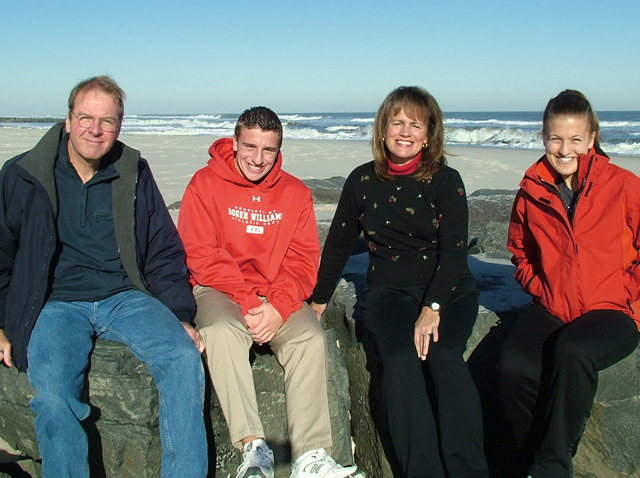 December 4, 2006. Has it really been a year? Time flies. 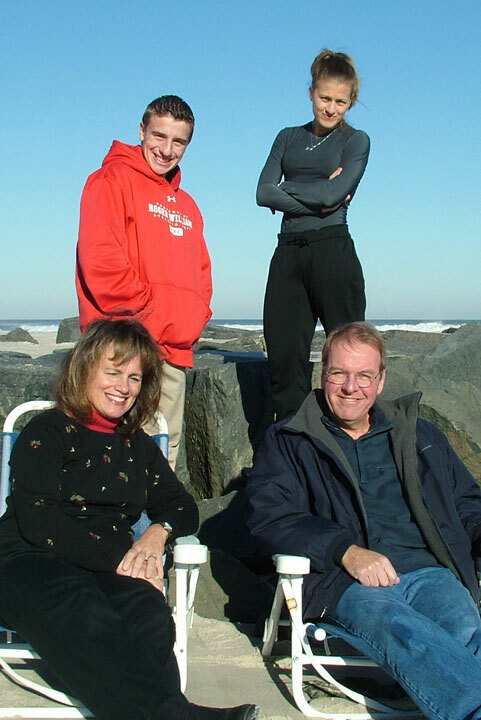 Here we are posed for our 2006 Xmas card photo. Here's an alternate pic. November 24, 2006. This looks to be the end of Austin's surfing season. Nice fadeout. November 24, 2006. 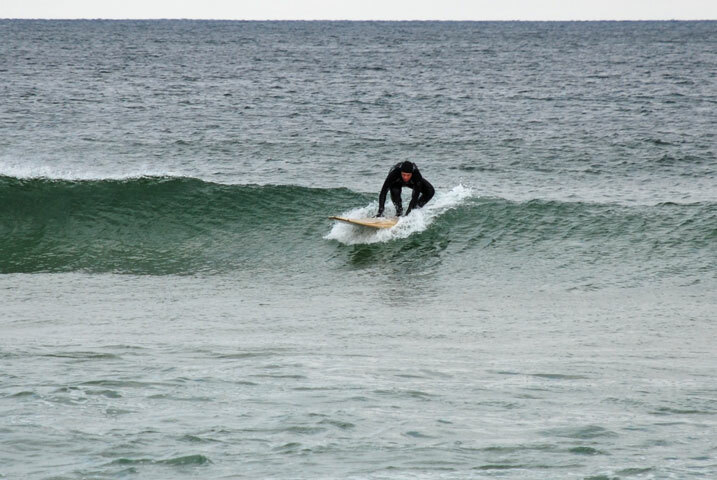 Following a nor'easter the waves are great. 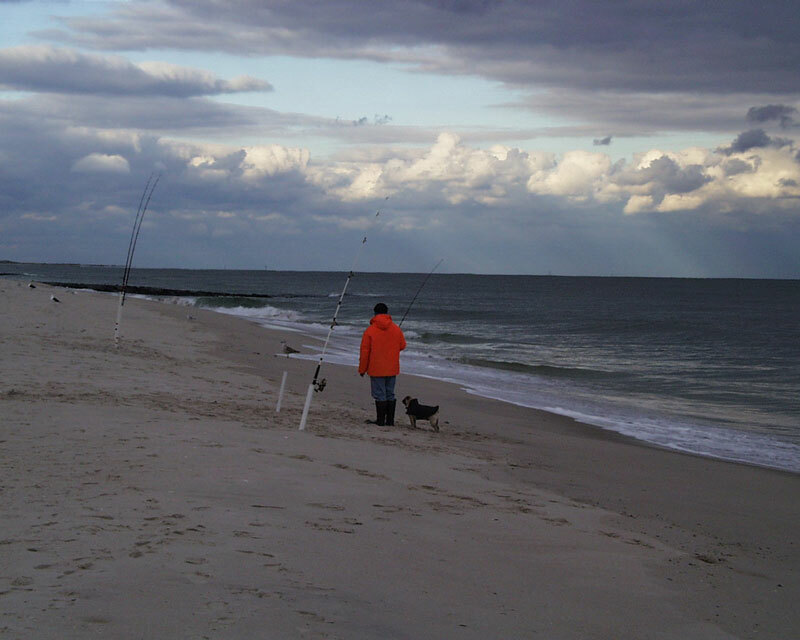 The water temperature hits 58 degrees as the Gulf Stream has been pushed westward by the storm. 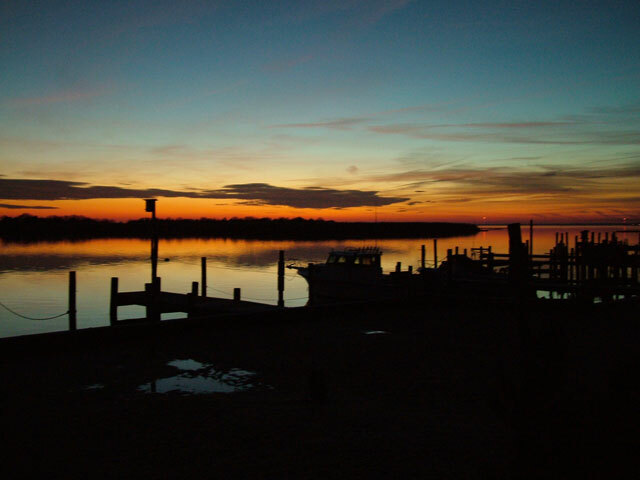 However, the hours of daylight are short. 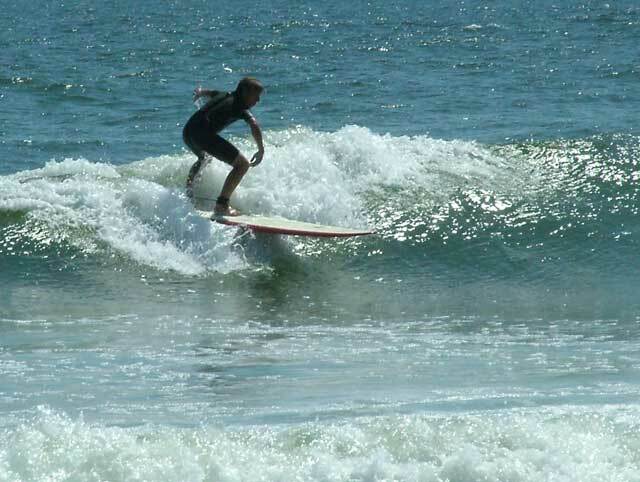 Here Austin gets in some late day surfing. November 24, 2006. The only known advantage of the eroding beach is that Austin now has a much shorter walk to the surf (but watch that first step!). Soon he may be able to catch a wave from our front door. November 23, 2006. 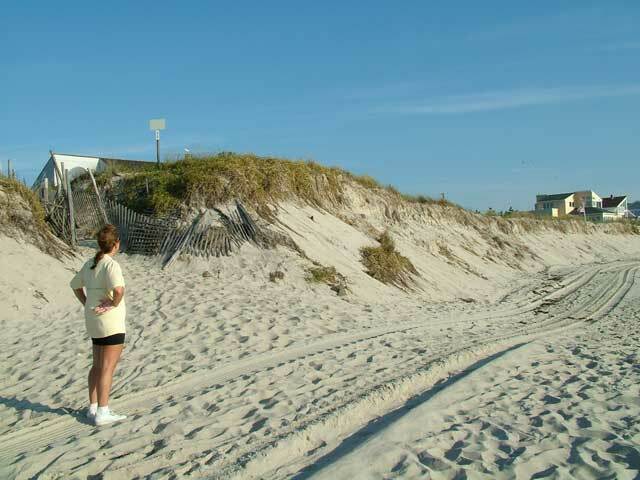 The new damage to the beach caused by erosion is significant. We really, really need our Army Corp of Engineers replenishment project to get under way soon. 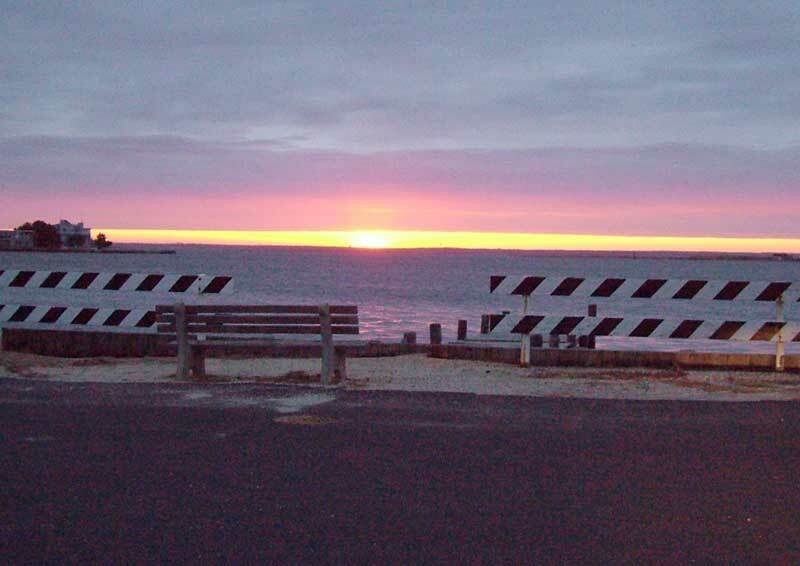 Without it we are risking this part of the island. November 23, 2006. Jackie tries out her wings. With 60 mph wind gusts, she comes close to being airborne. 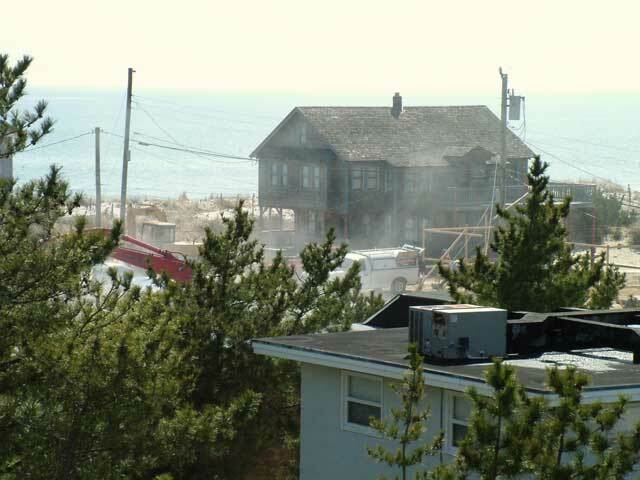 We are getting blasted with the blowing sand. 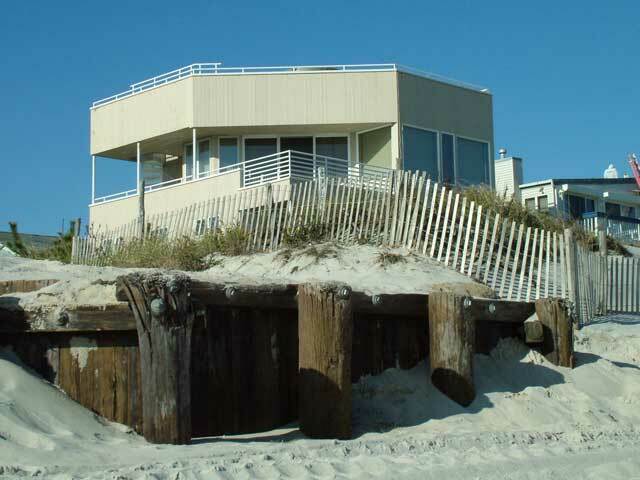 This is why oceanfront homes need so much maintanence. November 23, 2006. 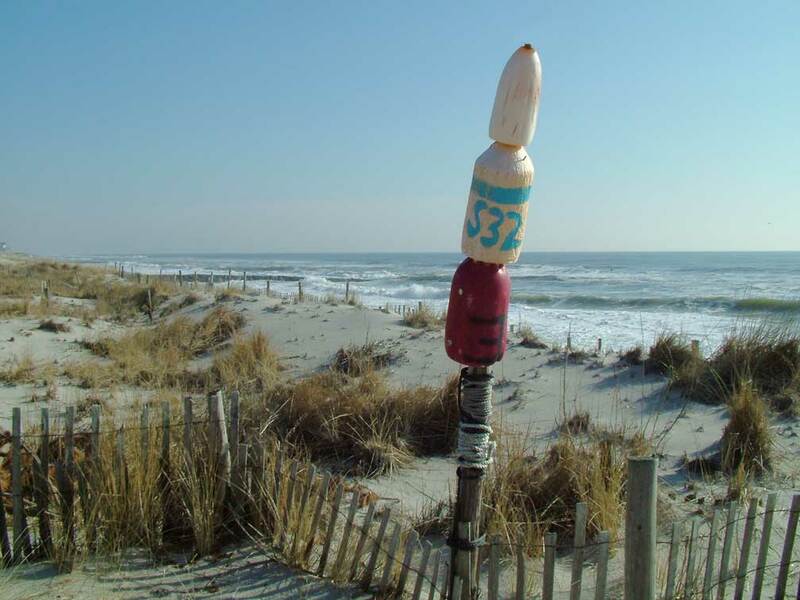 Another nor'easter, this one on Thanksgiving Day. 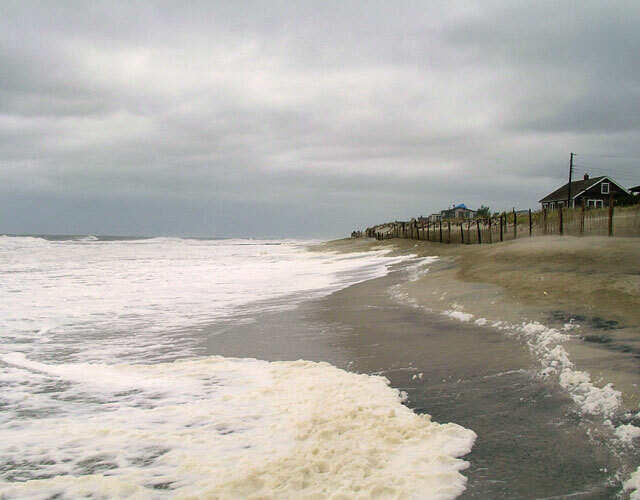 The beach gets devoured and waves run down Lee Ave. at high tide. October 7, 2006. 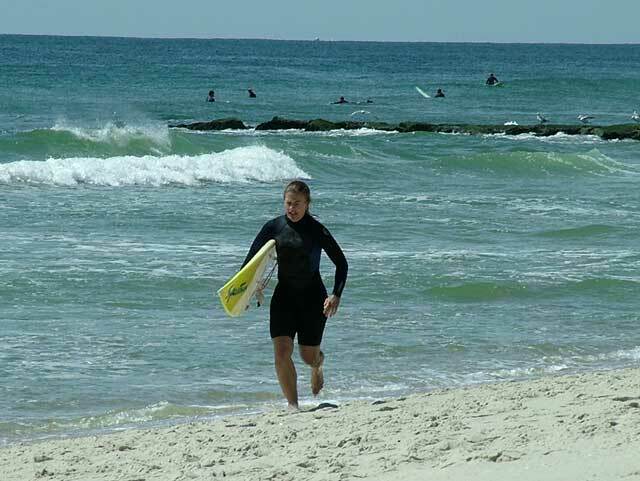 Surf's up, dude! 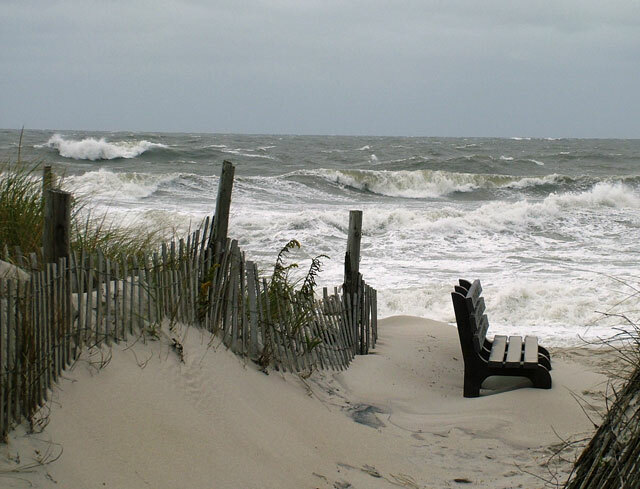 We have been experiencing severe winds and rough seas for the past two days. 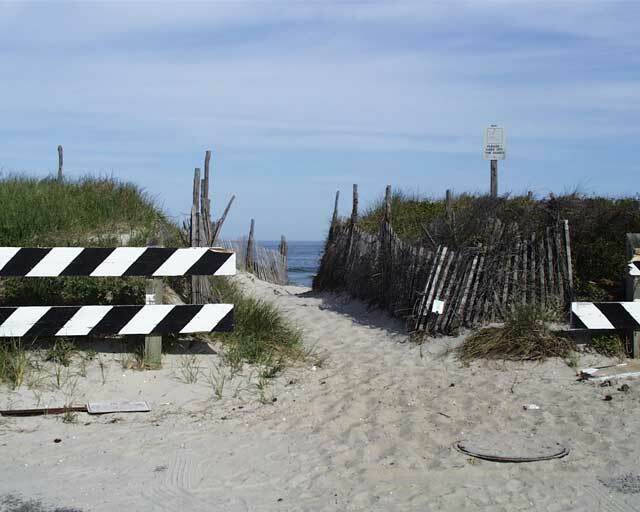 Crazy surfers may like this, but it's a little scary for us property owners. October 7, 2006. Where'd our beach go? This photo is from the end of our block. 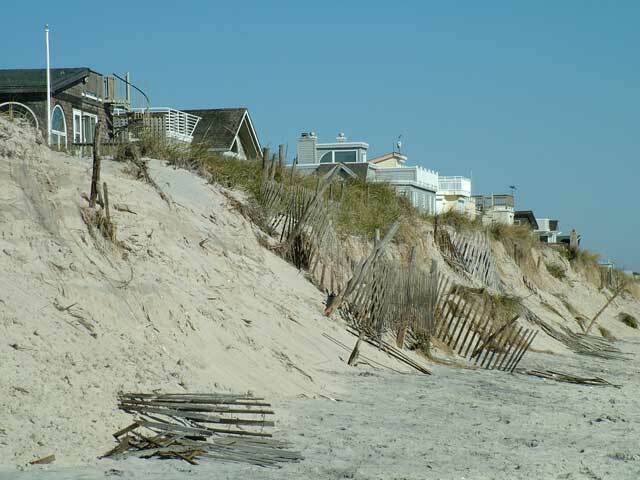 As usual, beach erosion and loss of our safety buffer are the main concerns. August 16, 2006. A cartoon in our local free newsmagazine captures the history of Long Beach Island. May 17, 2006. 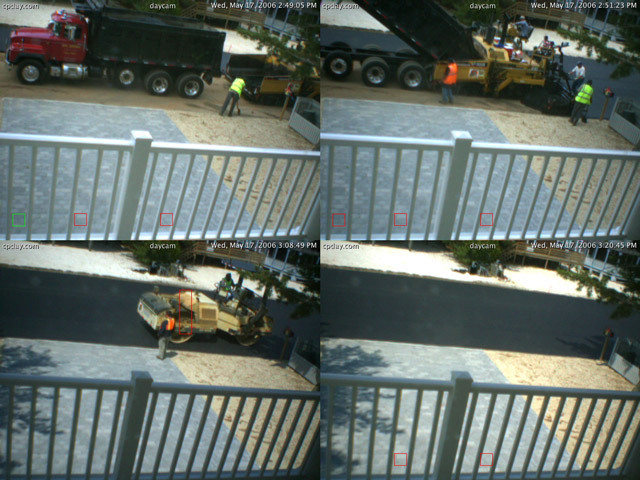 The Daycam watches Lee Avenue get paved. A years-long promise has been kept. March 26, 2006. 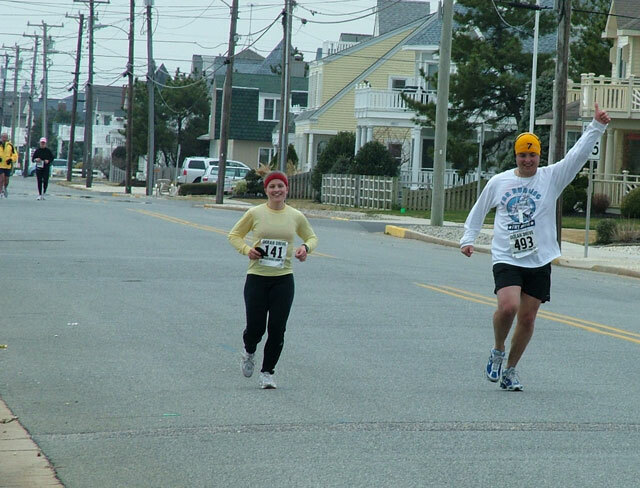 Within feet of the finish line in Sea Isle City, Jackie is now looking forward to a strong finish. She came in at a very impressive 4:18:52. March 26, 2006. At the 15-mile point Jackie still looks like she is having fun. March 26, 2006. 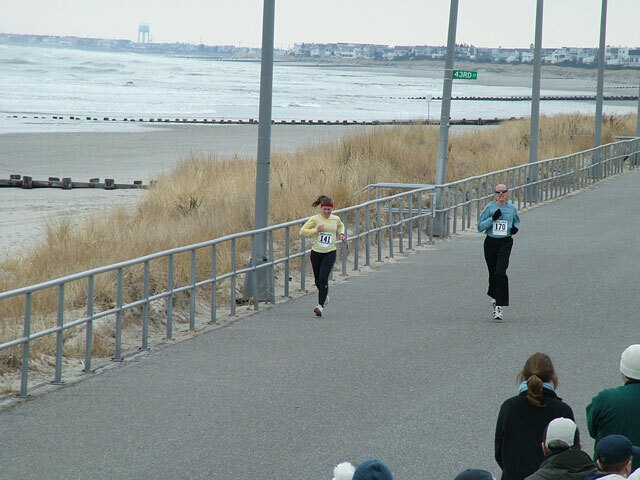 Fresh, trained and ready, Jackie is at the Cape May starting line for the 2006 Ocean Drive Marathon. 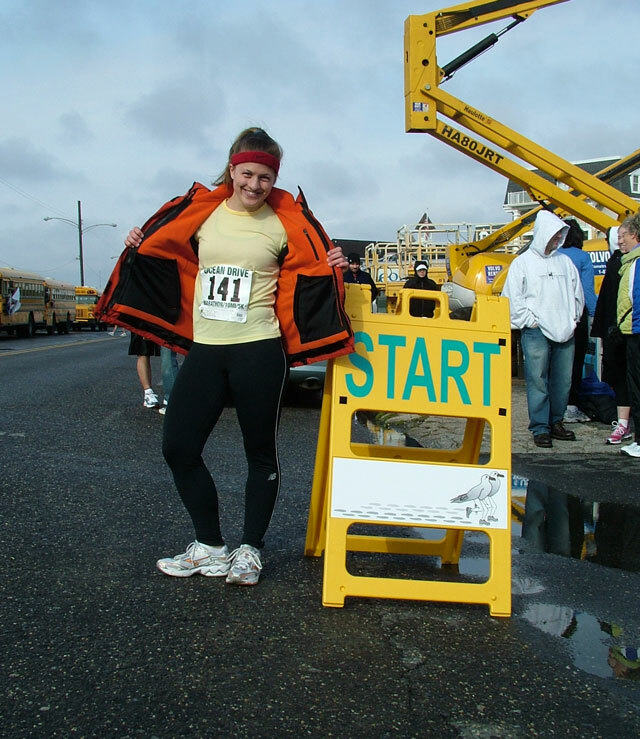 January 4, 2006. The new water main is already buried. 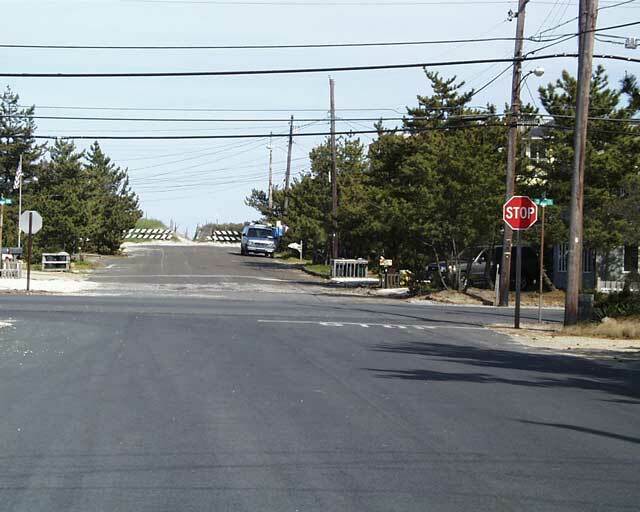 The new asphalt pavement will be applied in the Spring. January 4, 2006. 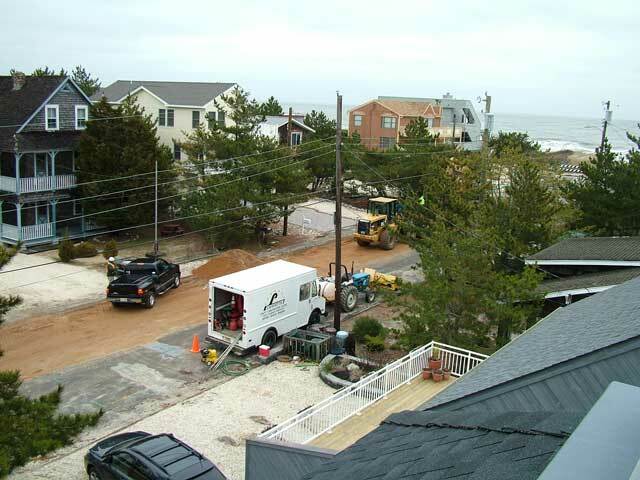 Lee Ave gets busy again as new water mains are installed. We've been promised new paving on our street for years. Now it looks like we'll get it. November 25, 2005. The weather changes frequently. I like the gray-blue tones in this photo. November 25, 2005. The Days gather on the top deck for our annual Xmas card photo. 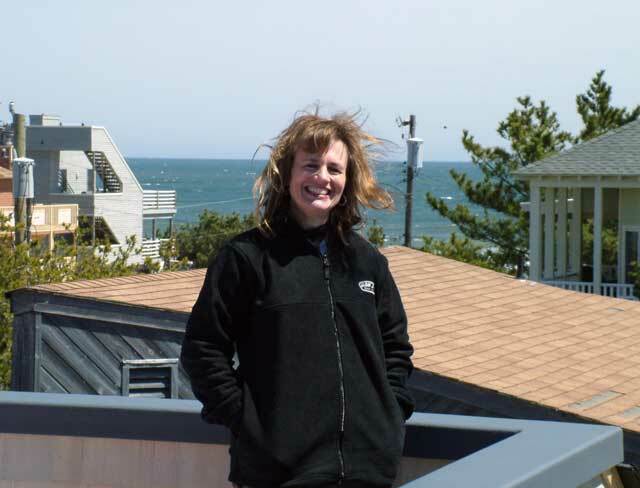 This was a cold and windy day. October 29, 2005. 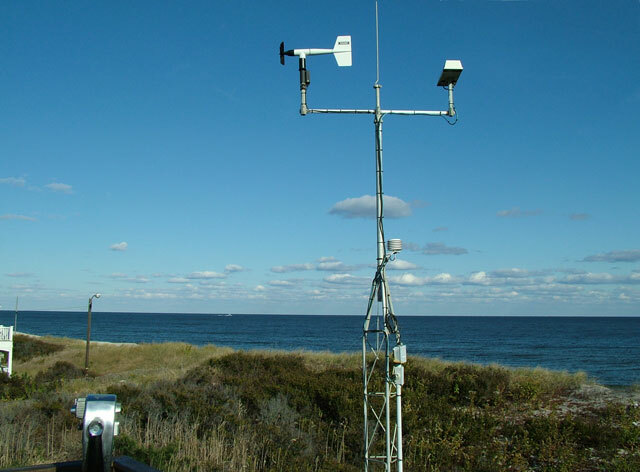 A combination of a Nor'easter and remnants of Hurricane Wilma Have left Harvey Cedars in a precarious situation once again. 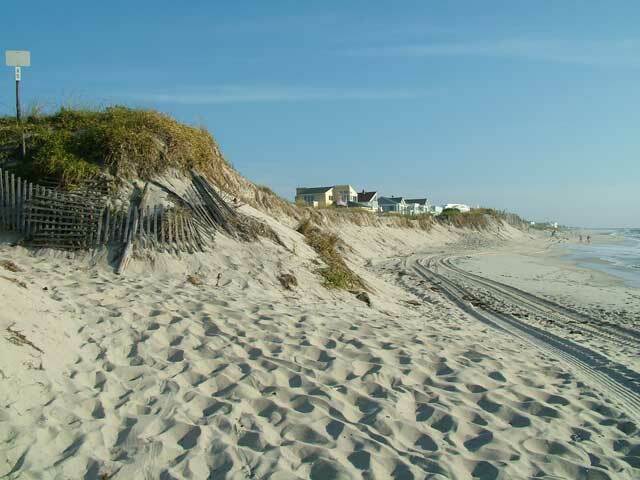 The entire shoreline is seriously eroded. October 29, 2005. 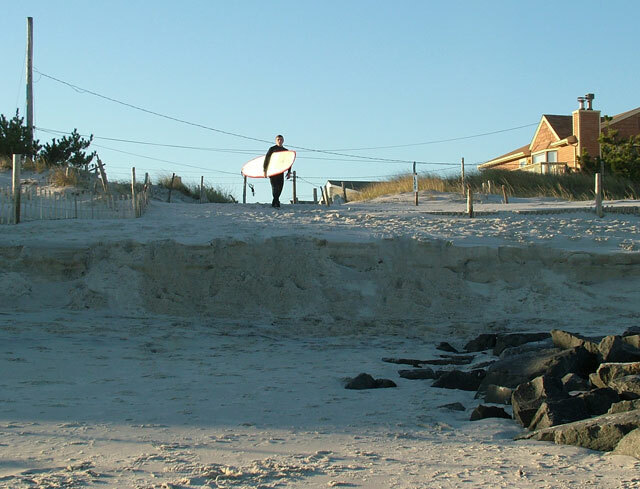 If Harvey Cedars loses another 20 feet of beach then some of the best real estate in town will be lost. 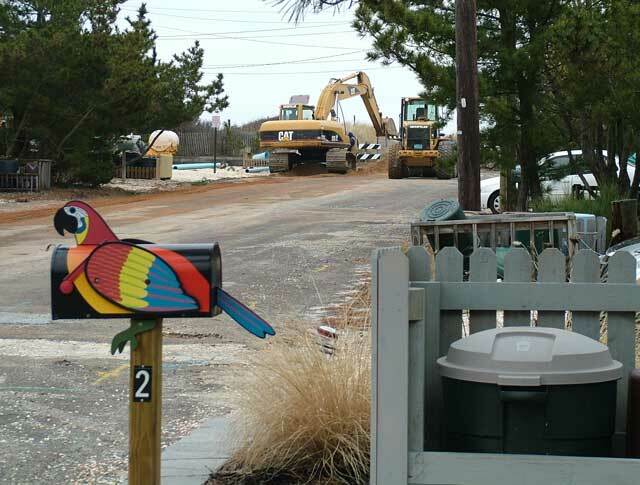 The first truckloads of new sand from mainland quarries are expected to arrive soon. October 29, 2005. 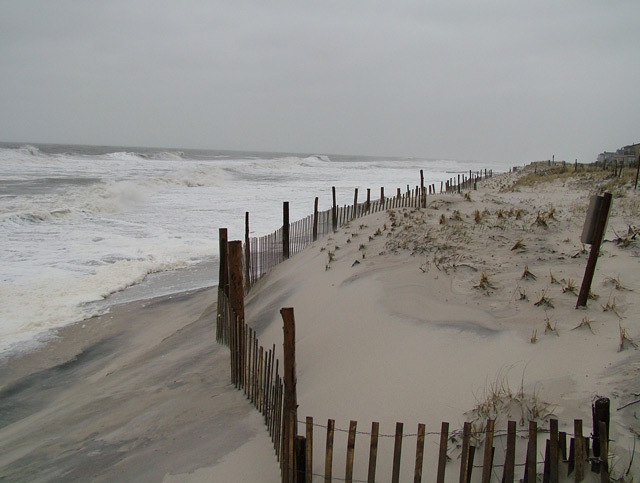 Dune grass and fencing are no match for the storms. 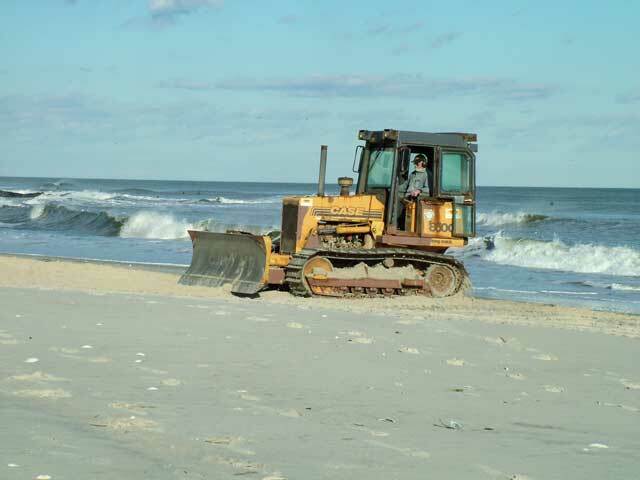 A more complete beach restoration will require pumping sand from off shore and lots of money. October 16, 2005. 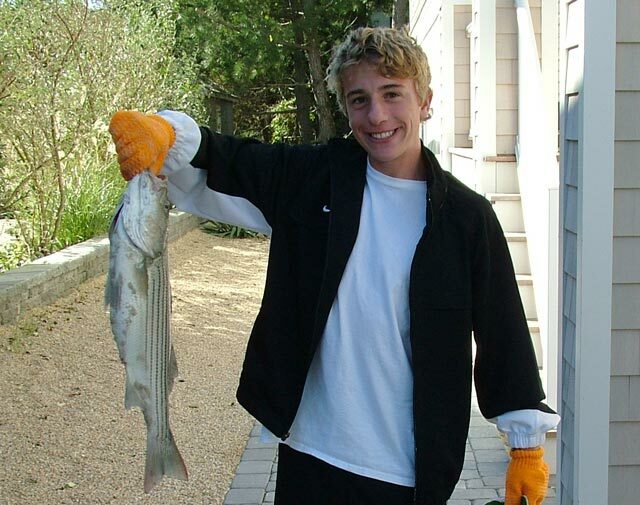 It was too late for the Tournament, but Austin landed this good-sized striped bass back at our Lee Avenue beach. October 15, 2005. 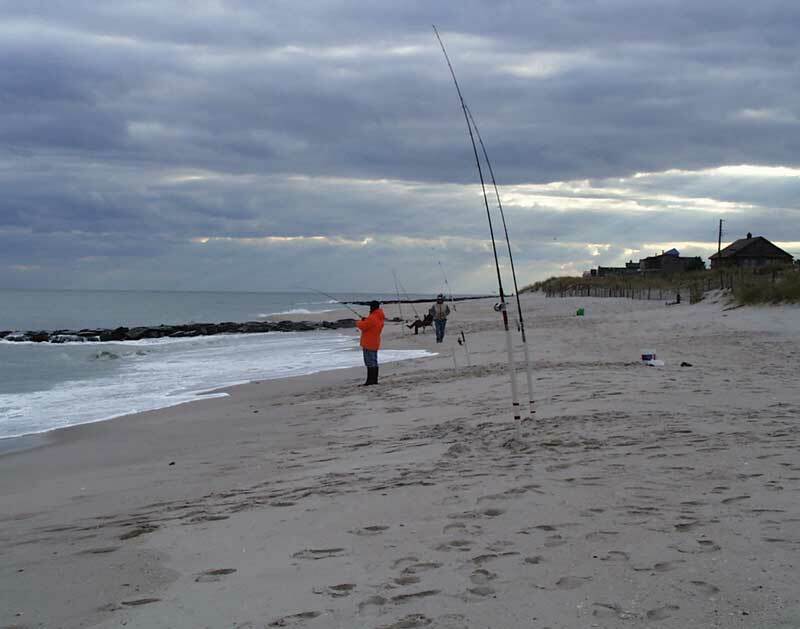 We went to the Barnegat Light Fishing Tournament, where the surf was apparently too rough for most of the fish. Austin didn't have any luck. October 02, 2005. 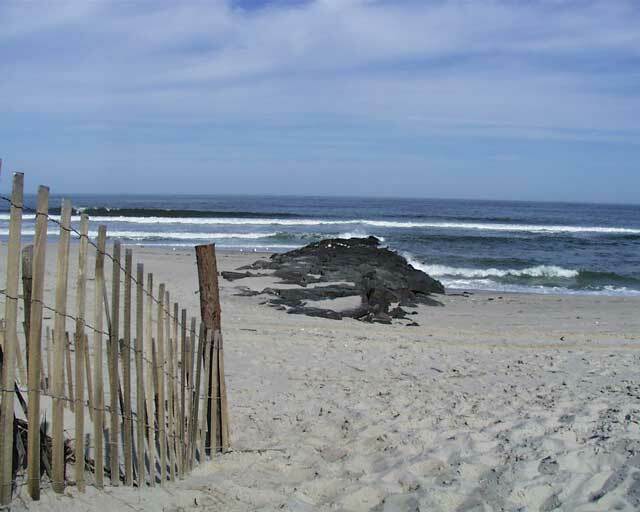 It's officially Autumn, but the water and the beach remain warm. 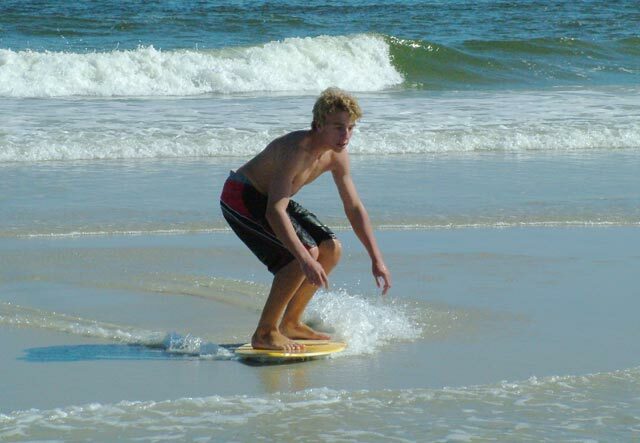 Austin proves it by skim boarding. October 02, 2005. It's hard to believe that he has homework to turn in tomorrow morning. What a shock to the system! September 11, 2005. Austin gets to surf some of the awesome waves stirred up by Hurricane Ophelia. August 13, 2005. 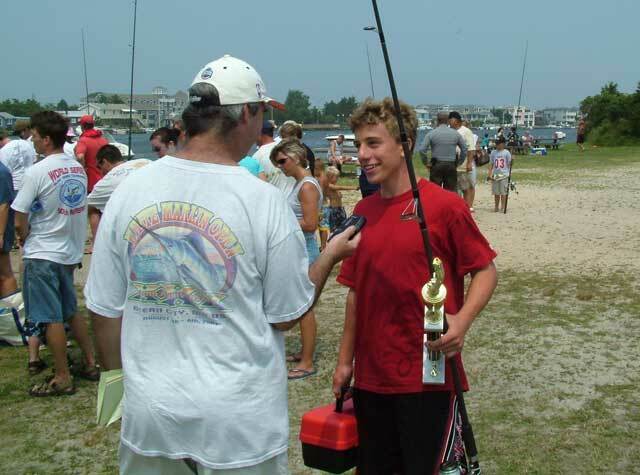 Austin gets interviewed by a reporter from the Asbury Park Press regarding his fishing prize. Click here to see the published story. August 13, 2005. 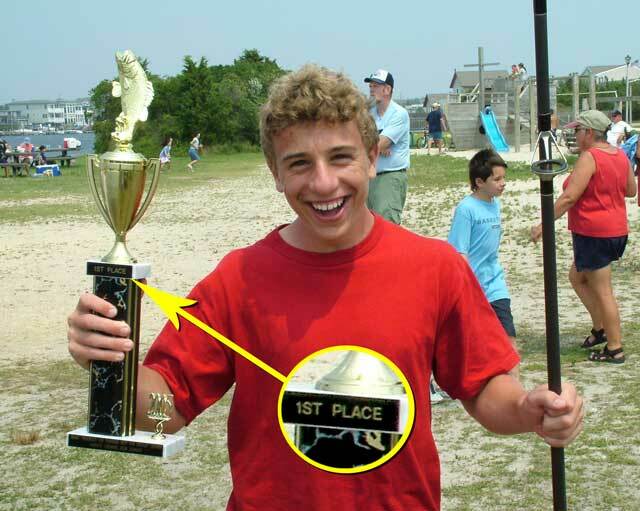 Does Austin look happy with his award trophy? August 13, 2005. 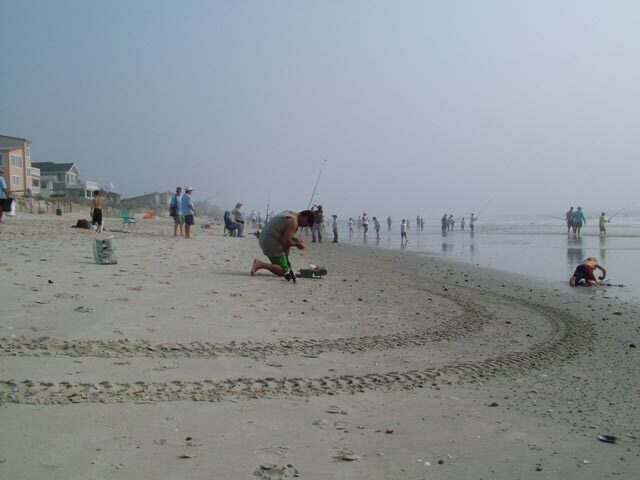 The beaches are crowded with contestants in the fishing contest. August 13, 2005. 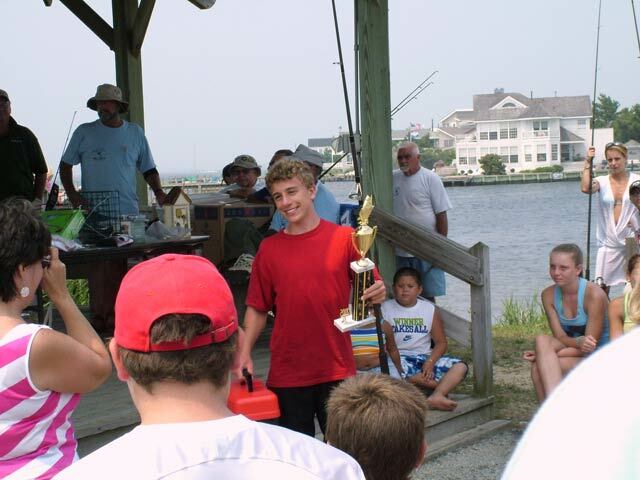 Austin casting his line in the Harvey Cedars "Hooked on Fishing" contest. July 29, 2005. 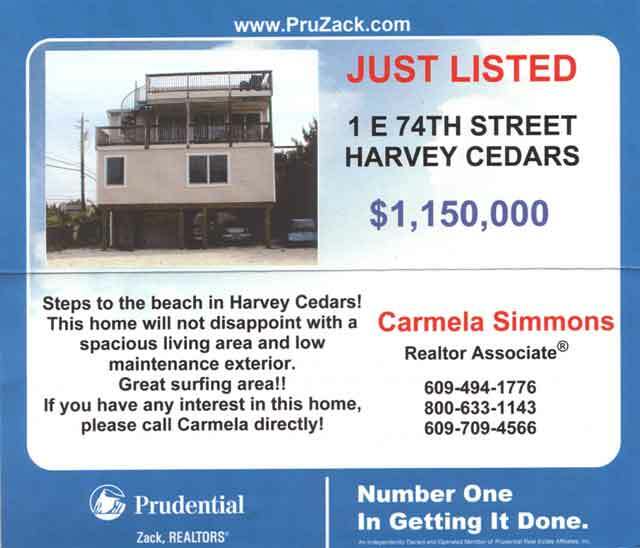 A scan of another Prudential Zack flyer, this one describing the recently renovated house at #8 East Lee Ave.
June 16, 2005. 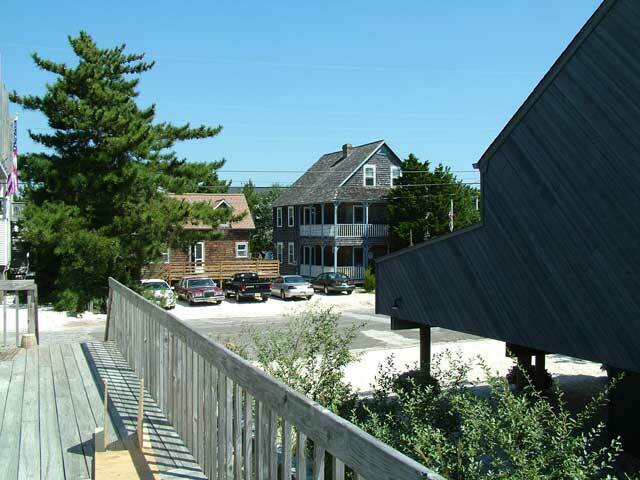 The view of my favorite cedar house is crowded by new homes. May 25, 2005. 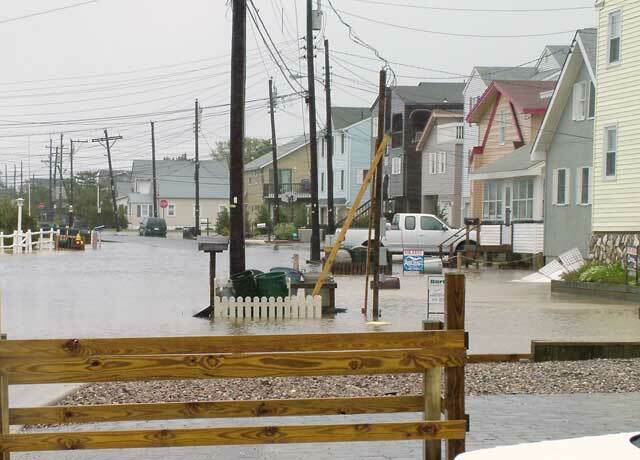 Another Nor'easter and again my apartment neighborhood is under water. Apr. 20, 2005. 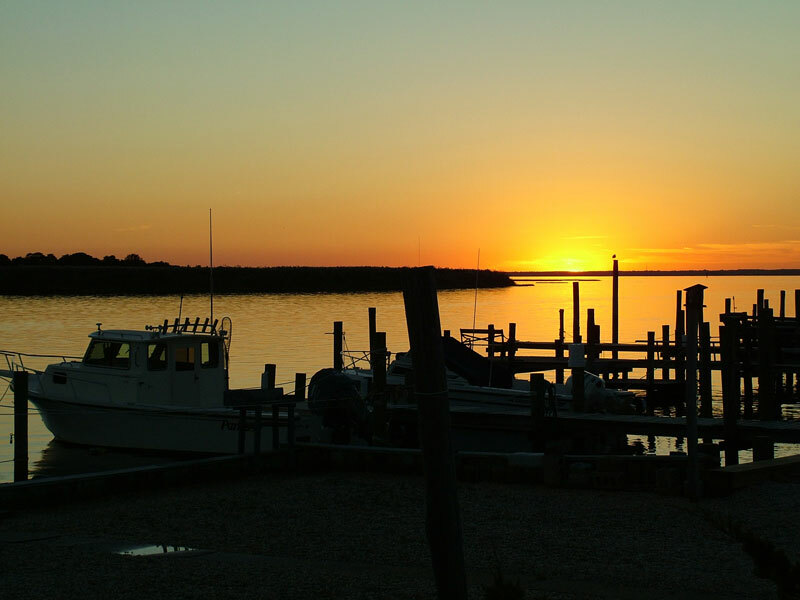 Sunset at Ship Bottom. Apr. 19, 2005. 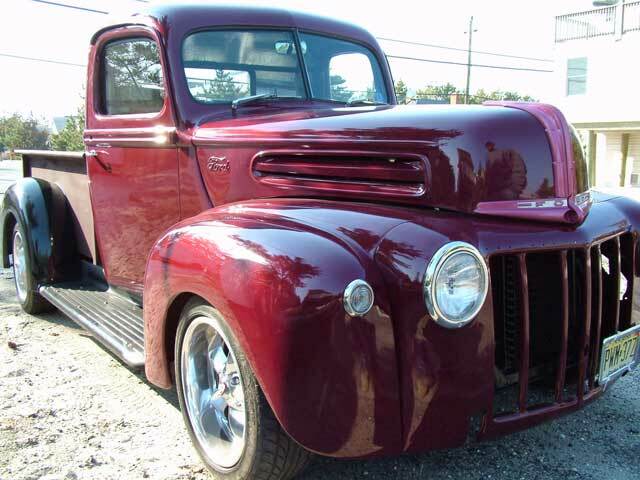 The Fishers (Roger & Jeff) took 14 years rebuilding this 1946 Ford pickup. Roger brought it to the house today. 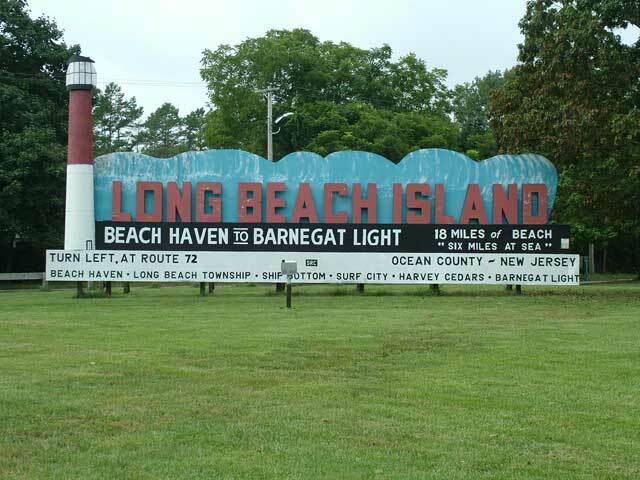 We took it on a ride to Barnegat Light. Apr. 9, 2005. Jayne made a visit to review kitchen cabinet plans and check out the top deck. Mar. 22, 2005. The rapid pace of demolitions continues. Two more occur behind us, as seen from our upper deck. This raises a lot of dust. Dec. 29, 2004. The upper deck at the new house offers a view of the boulevard to the south. Dec. 29, 2004. An alternate view of the boulevard from the upper deck is to the north. Dec. 8, 2004. 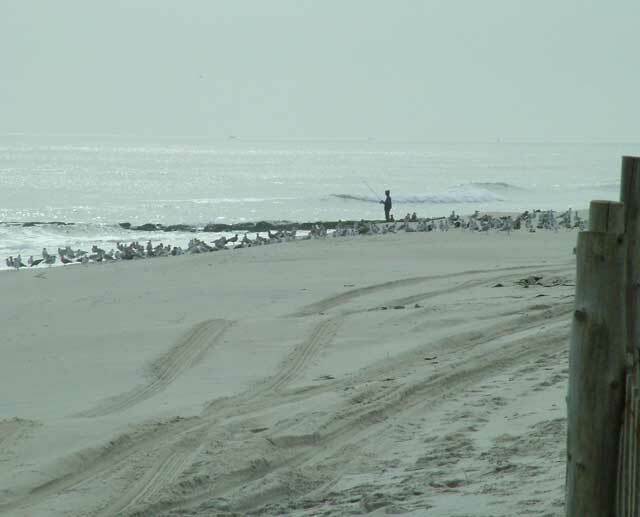 Town maintenance crews battle the beach erosion near Cumberland Avenue. 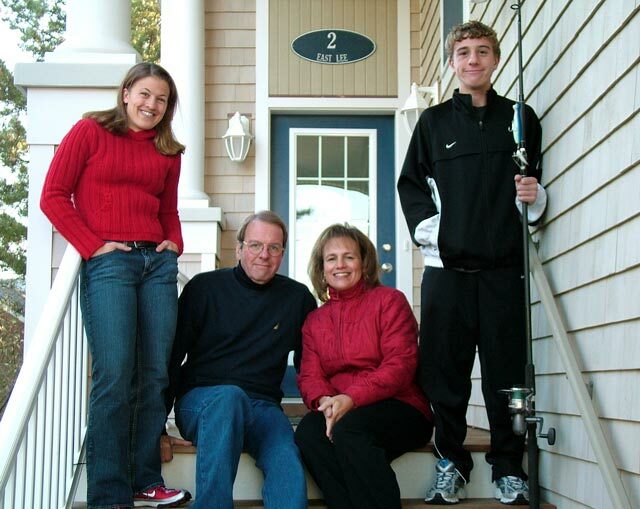 Dec. 2, 2004. Yet another great sunset. Same place. Nov. 26, 2004. 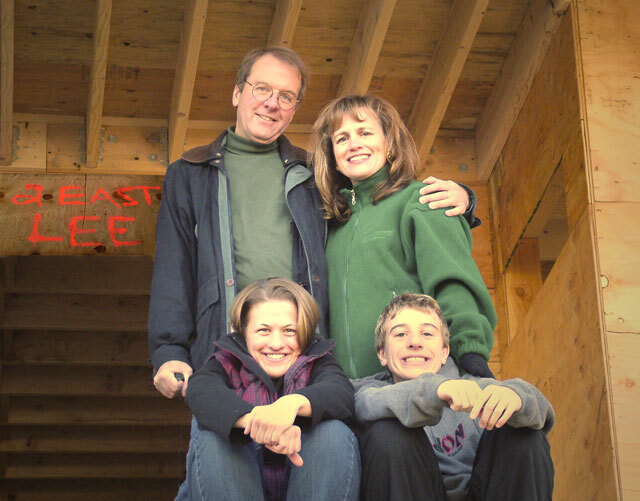 We took our Xmas card photo on the unfinished mid-level front deck. Nov. 22, 2004. 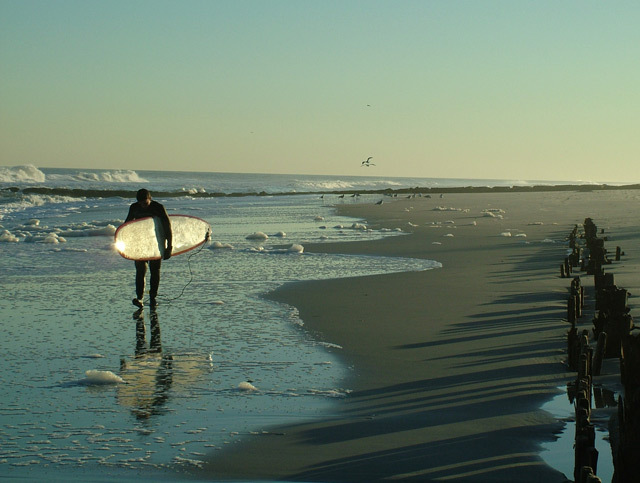 A lone surfcaster competes for space with the seagulls. Nov. 17, 2004. 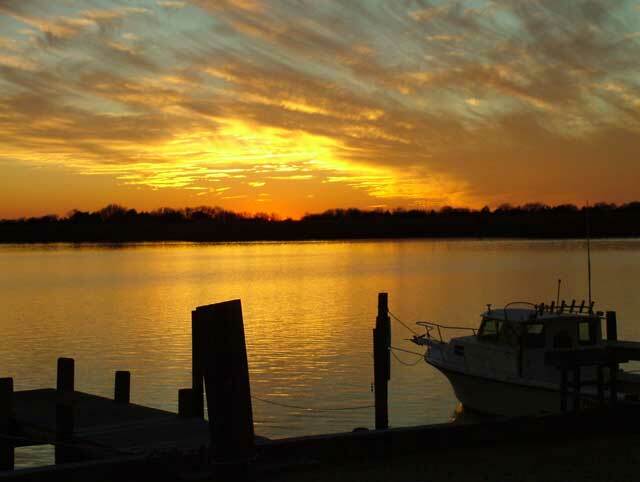 Another sunset at winter quarters. Nov. 10, 2004. 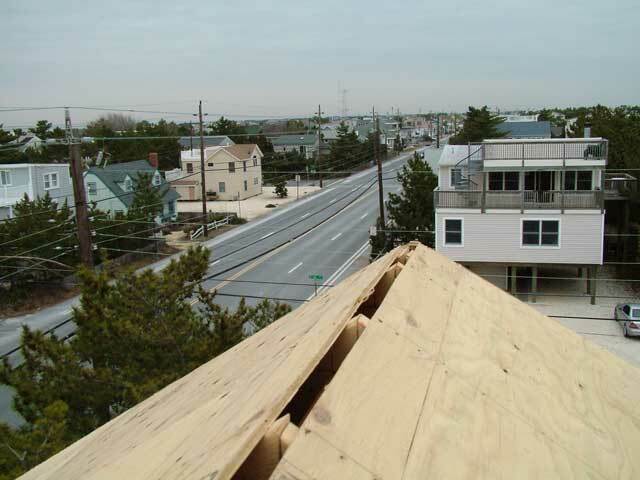 The Web cam station in Brant Beach, as it looks up close. 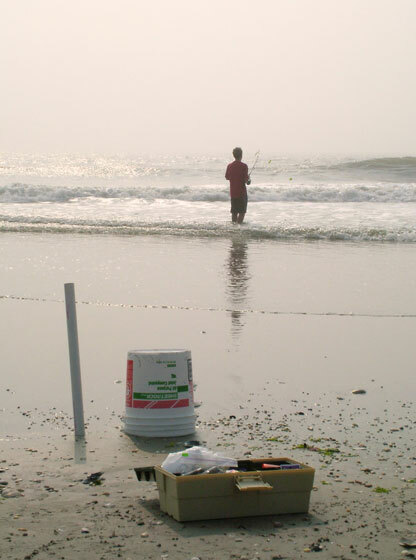 The background should look familiar to anyone who has viewed the beach cam. Nov. 10, 2004. 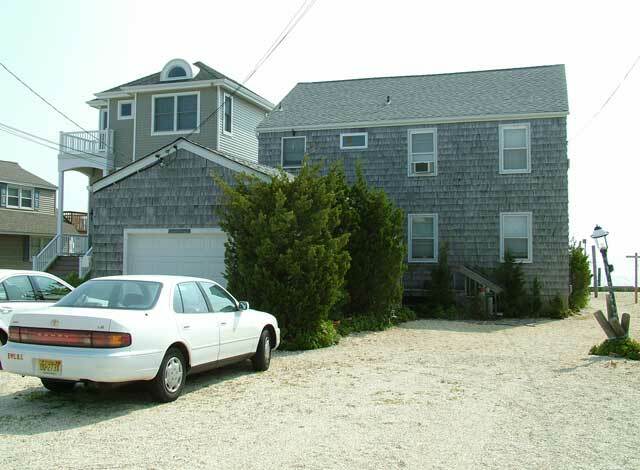 The Cumberland Ave house in which we stayed some years ago continues to be threatened by beach erosion. 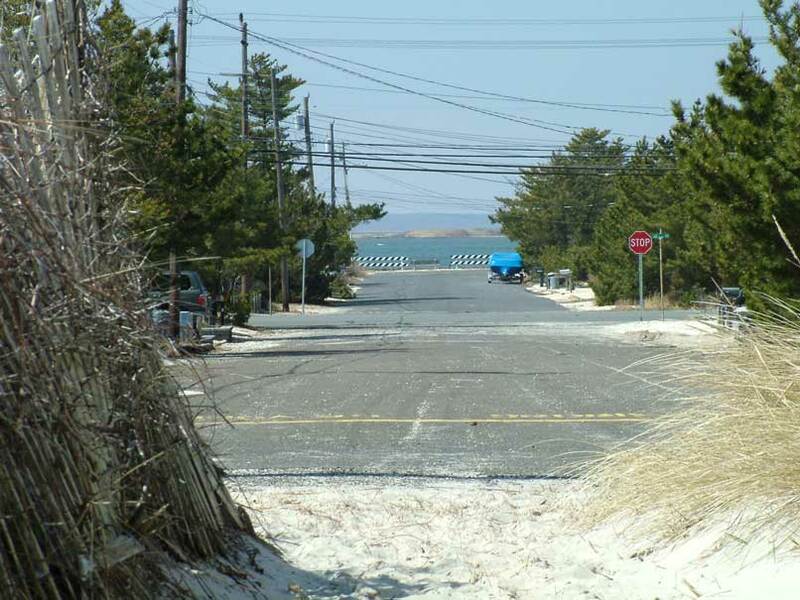 The normally-buried road bulkhead is exposed. Oct 20, 2004. 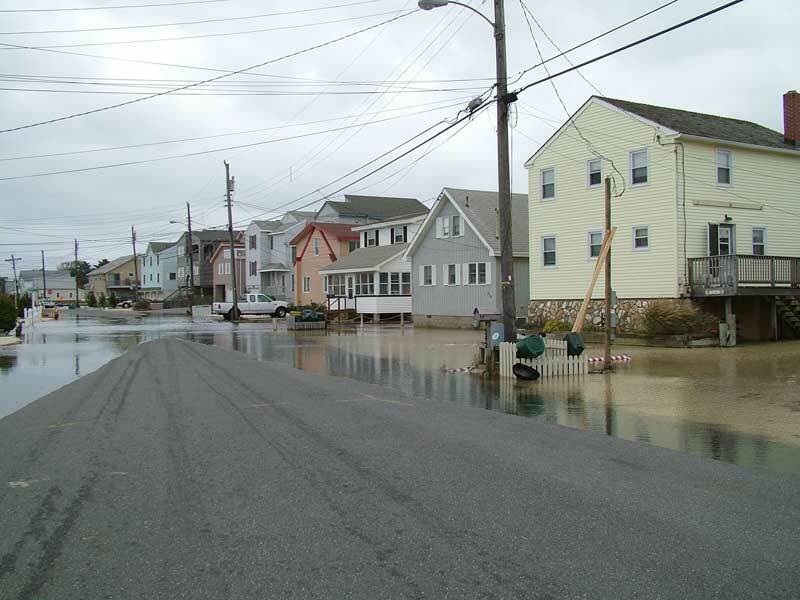 The street at my winter quarters (27th street in Ship Bottom) is flooded during several days of heavy gales. I was stranded during high tides. Oct 12, 2004. 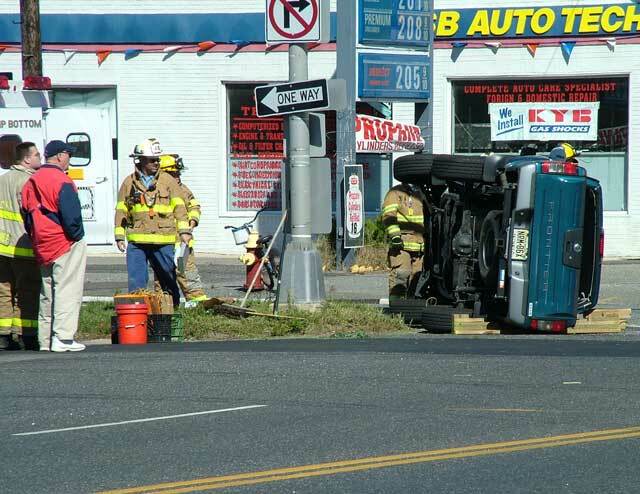 After Columbus Day, speed limits on the island are loosened, many traffic lights are turned off, and accidents happen. I saw this one at noon. Oct 6, 2004. Two doors away from us is #6 East Lee Ave. This is the Lucky Penny House, one of my favorites in the neightborhood. Oct 6, 2004. 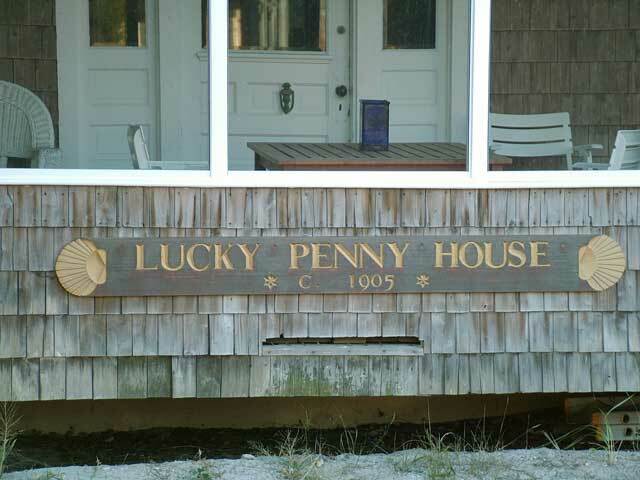 A close up of the Lucky Penny House attests to its ability to survive many hurricanes and nor'easters. 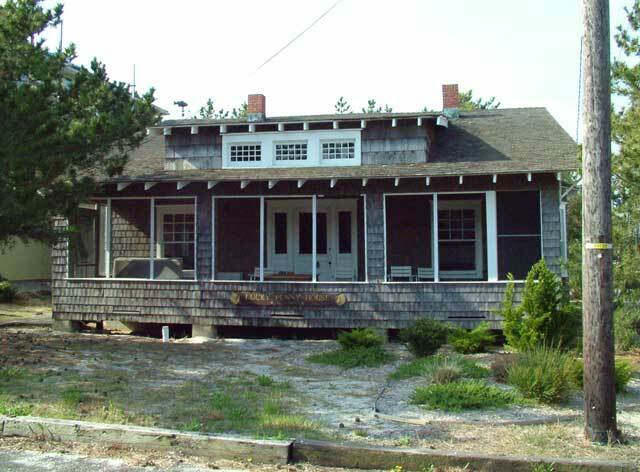 It was one of the two original Isaac Lee worker cottages surviving (see history). Oct 6, 2004. 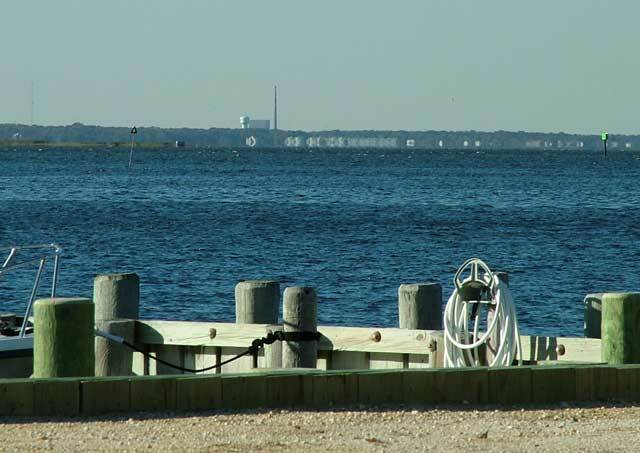 The Oyster Creek Nuclear Plant, a good neighbor on the mainland, is visible from Lee Ave via telephoto lens. Sept 19, 2004. 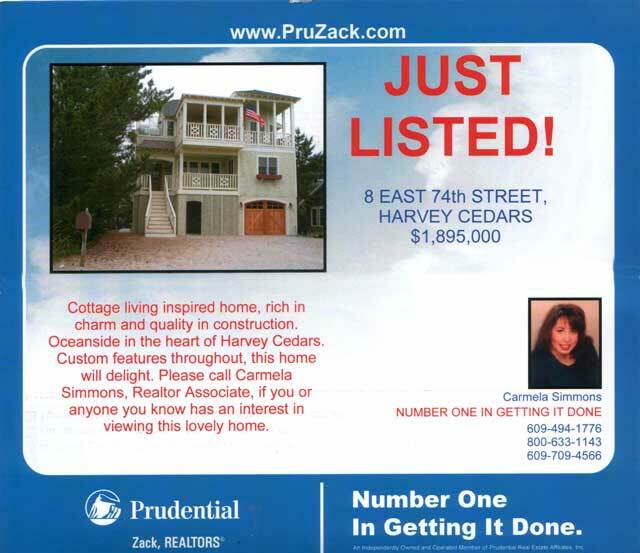 A scan of the Prudential Zack flyer describing the house across the street, currently for sale. Sept 17, 2004. 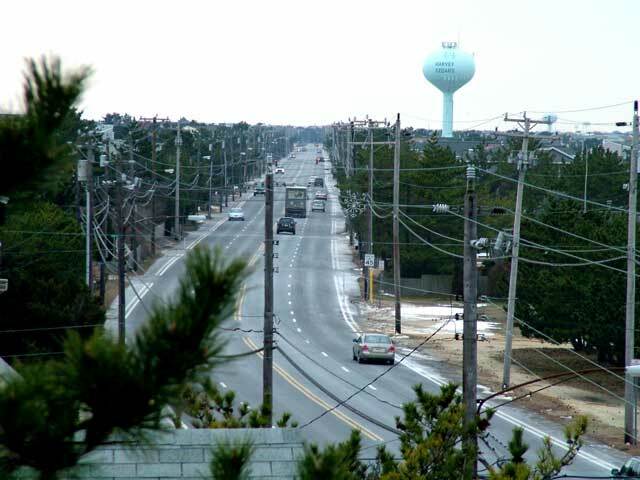 An old billboard on Route 9 in Manahawkin still beckons tourists to come out "6 miles at sea" for "18 miles of beach." Sept 2, 2004. A view of the neighborhood. The Isaac Lee farmhouse, built in 1890, is the tall shingled building. Sept 2, 2004. 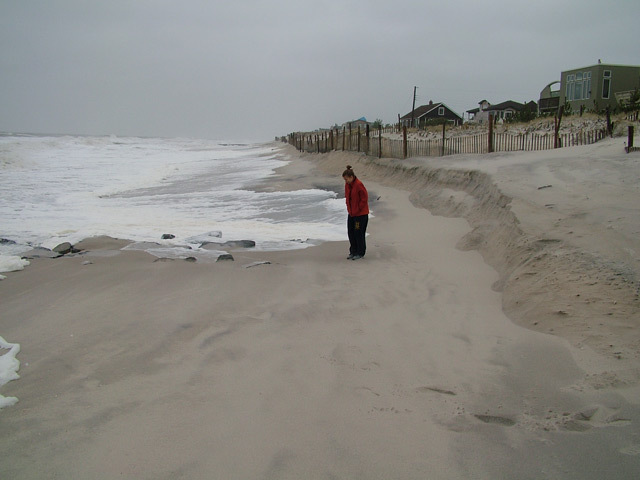 On her morning walk Jayne inspects the heavy beach erosion at 85th Street. Sept 2, 2004. 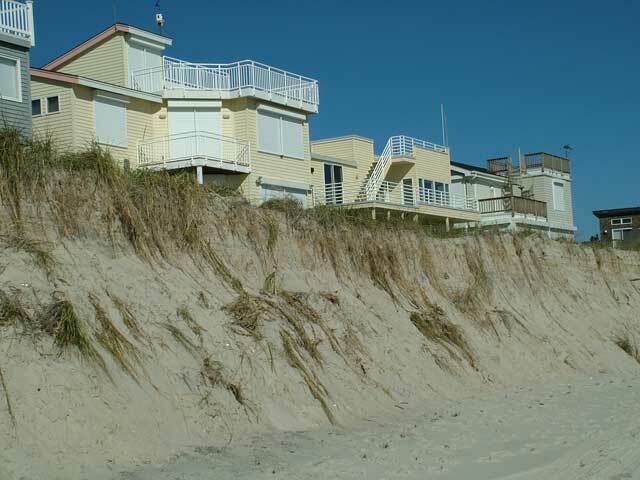 Another view of the beach erosion between 85th and 86th Streets. May 29, 2004. 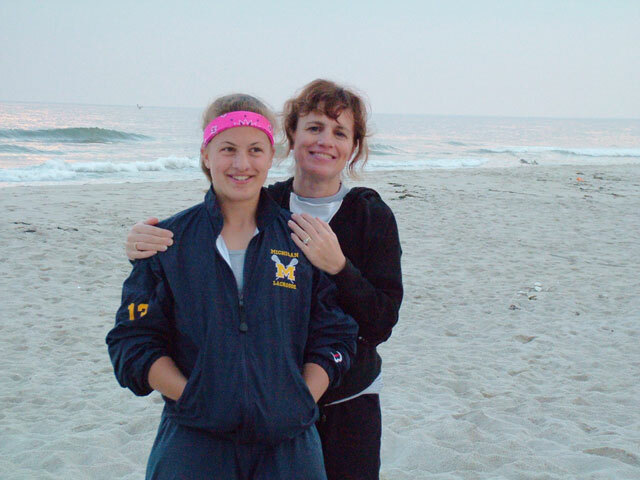 Jayne & Jackie, late day at the beach. May 29, 2004. Jackie and her surfboard. Mar 28, 2004. 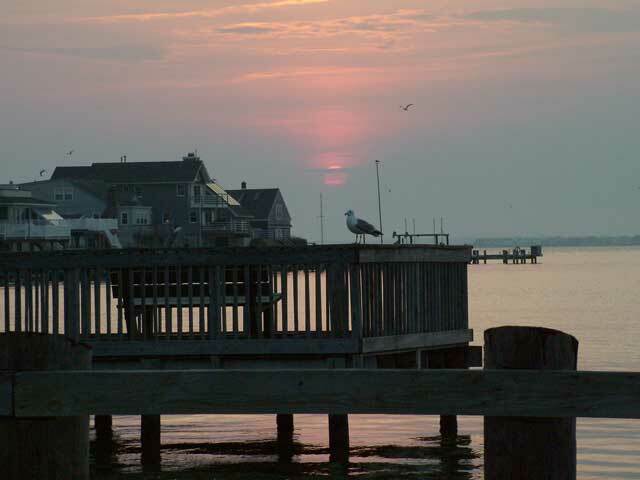 Tonight's sunset at the Lee Ave bay dock. Mar 20, 2004. Lee Ave, from the beach to the bay. 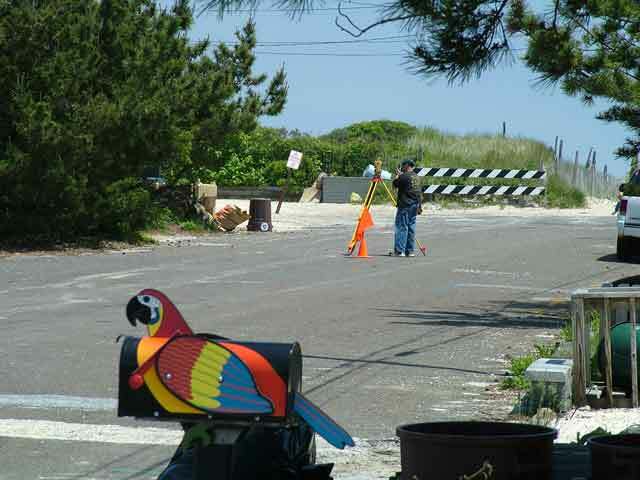 The parrot mailbox can be seen on the left. Mar 20, 2004. Early morning at the beach. Sunny, but still cold. Mar 20, 2004. 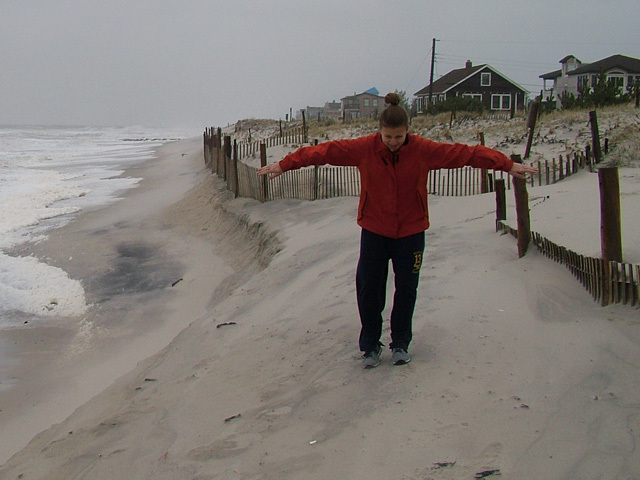 The beach at Lee Ave is fairly large this year, despite (or perhaps because of) several strong storms. Nov 2, 2003 . 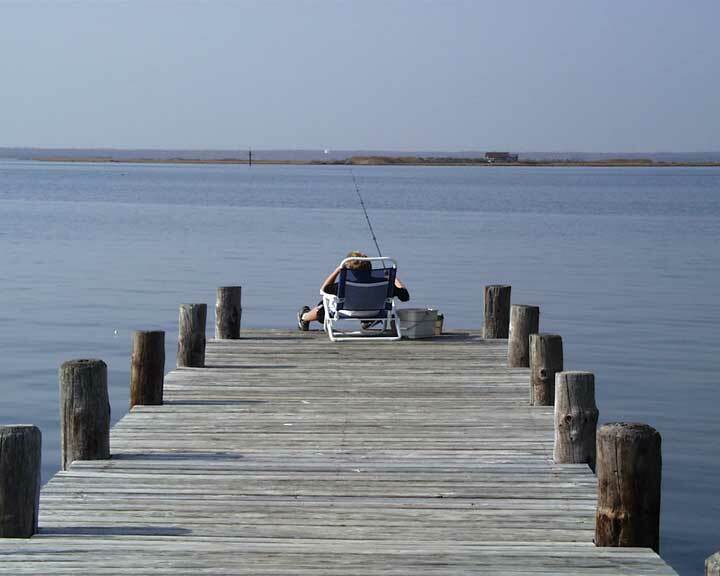 Austin enjoys a warm day in November by fishing at the Lee Ave bay dock. Oct 23, 2003. 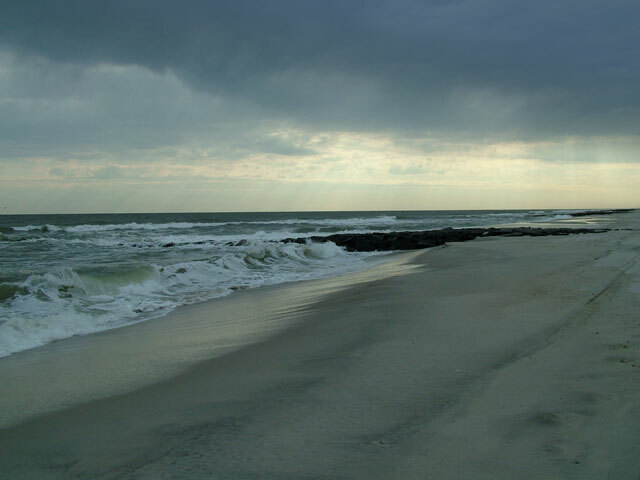 The beach on a chilly Autumn afternoon. 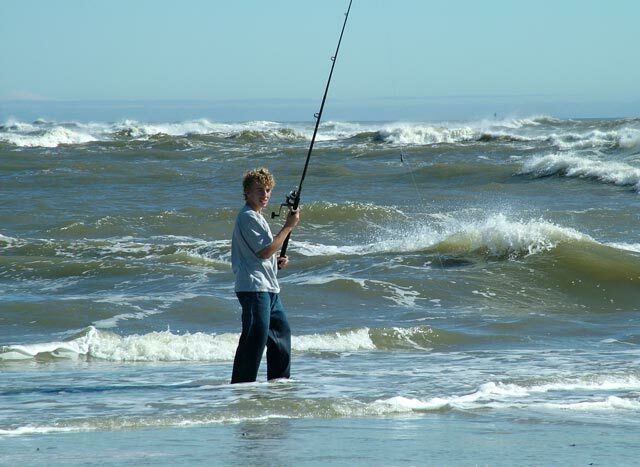 It's still good enough for surf casting..
May 20, 2003. The view of the length of Lee Ave (aka 74th St). Long Beach Boulevard divides the street into the bay side (foreground) and ocean side. 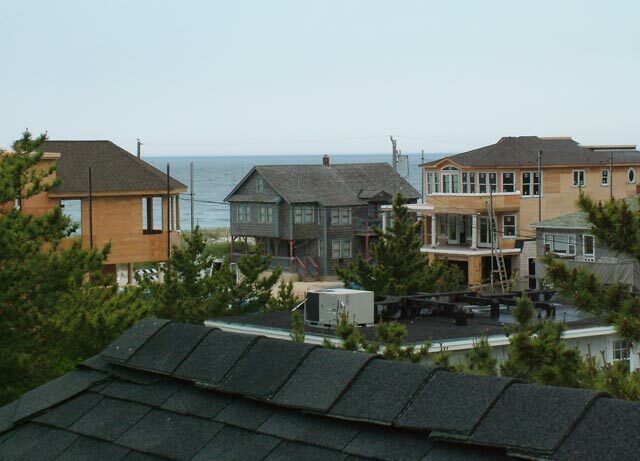 Our house is on the ocean side of the boulevard, on the right in this picture. May 20, 2003. 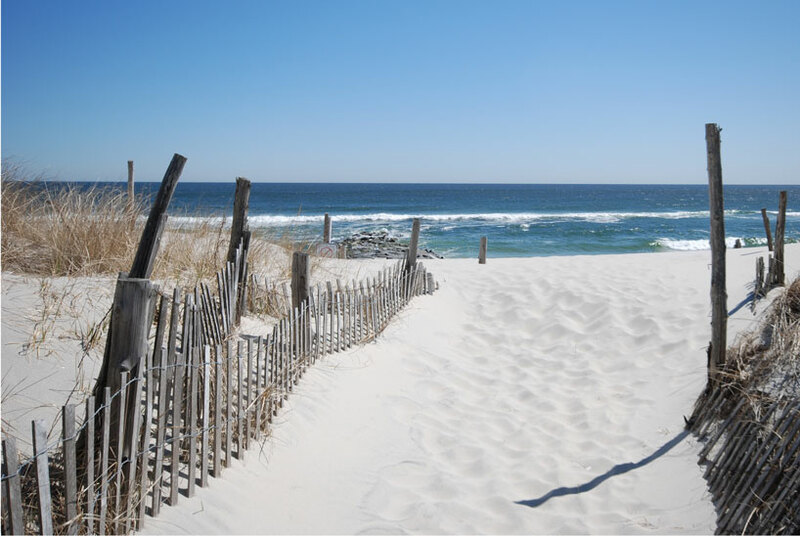 The pathway to the beach. May 20, 2003. The beach. Lee Ave has its own jetty. A little better protection from storms? We'll see. May 20, 2003. The beach at Lee Avenue..